Every blogger wants his blog to look best among his competitors blogs. This widget will add a bit more chunks of awesomeness in your blog. The concept of this widget is simple. This is more or less like Exit Effect we add in Microsoft Powerpoint's Custom Animation. Just like that whenever the visitors will click any link to leave the current page, inspite of the old boring loading it will have animation. A live demo can be seen on my blog itself. Just click any link here and you could see the change. To add this effect to your blog do the following things. Add the below given code just above </body>. After adding this code, save the template. You are done now. 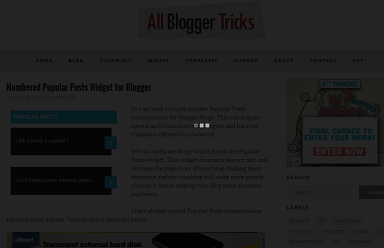 Now you and your visitors can see this awesome and cool Animated Page Loading Effect in you blogger blog. May I have your blog URL please. May I please have your blog URL with the code added so that I can checkout the problem. By default it opens in the same tab / same window. Not working bro.. plzz help..
Not Working Plz Help Me !!!! @All Make sure you have the Jquery Plugin there in your blog. Thankx Man It's Working !!! Just installed Jquery Library.It's Working now. THANK YOU!!!!! IT WORKED. YOU'RE AWESOME. wow cool, it worked ! Jquery Plugin must be missing check other comments for help. sir..mine also not working..i already installed SEO Friendly before. thanks for your tutorial..(y) it works in my blog. I downloaded JQuery but it still doesn't work. Can u please help? Sorry but I didn't find the relevant code in your blog. WORKING PERFECT BRO NICE POST VERY USEFUL CHECKOUT-MY WEBSITE. I wanted my Navigation bar to appear during Loading..
Can u help me out of this ?? Wow it works and is very cool! sir how to add jquery in blogger ??? hey its not working on my blog too can you help me?? Not working on my blog page.. can you have a look?? Change gif image to any.